Well, school has officially started. I am so excited to be back in the swing of things. The take-home folders went home today so parents can know which items it is important for them look at and which items are ready to live at home. I added a zipper bag to the front of the folder this year for students to keep pencils and crayons and possibly flash cards. There is a page with my teaching philosophy on it, a snack assignment page, and space for the school calendar and rules book, this will be added as soon as we get it. 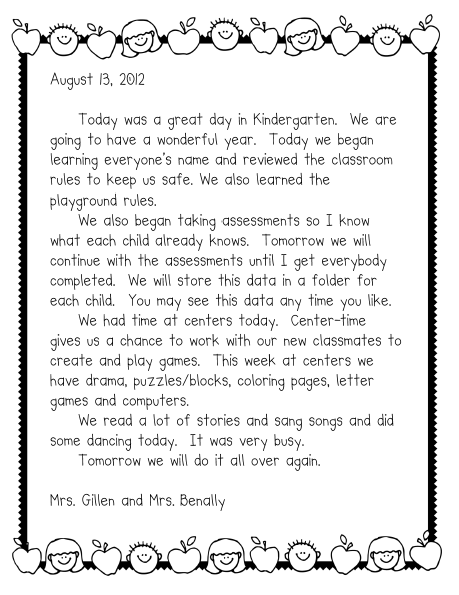 The final section of the take-home folder is the Daily Report. 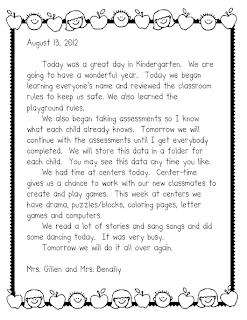 Every day the children tell me what they learned and I type it on a sticky label that they affix to the Daily Report. The students also color the label to match the color their clip was on on the Behavior Chart.